These delicious spiced cupcakes are great for any time of the year, and they're a perfect dessert for a Halloween party or birthday celebration or make them for a weekend treat for your family. Use a spiced apple butter in the recipe, or use homemade apple butter. Line 24 muffin cups with cupcake papers. In a bowl, combine the flour, baking powder, soda, salt, cinnamon, nutmeg, and ginger. Set aside. In a mixing bowl with electric mixer, beat 1/2 cup butter with the brown sugar until light and fluffy. Beat in the eggs and vanilla until smooth and creamy. Beat in the apple butter until well blended. Slowly beat in the flour mixture, alternating with the milk. Beat until smooth and well blended. Fill cupcake papers about 2/3 full. Bake for 18 to 20 minutes, or until a toothpick inserted into the center of a cupcake comes out clean. Cool in pan on a rack for 10 minutes. Remove from the pan and cool completely before frosting. In a mixing bowl with electric mixer, beat the cream cheese with 1/2 cup of butter until light and fluffy, about 5 minutes. Beat in the vanilla. With a mixer on low speed, blend in the confectioners' sugar. Increase the speed to high and beat for 2 to 3 minutes longer, until fluffy. Frost the cupcakes with a spatula or knife or use a pastry bag and decorating tip. If you must place plastic wrap over the cupcakes, spray it with nonstick cooking spray to keep it from sticking to the frosting. 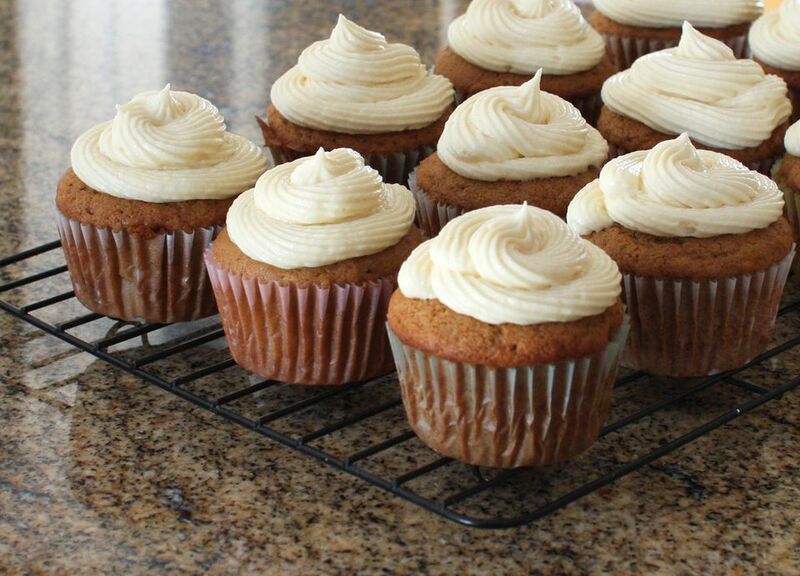 This fluffy caramel frosting would be great on these cupcakes as well. Use pear butter or peach butter instead of apple butter.